Known for a book that is often found in Top 100 lists — Paradise Lost — “John Milton” is a name recognised by most literature buffs. He died in poverty, blind, and in ill health: a sad end for a gifted writer. 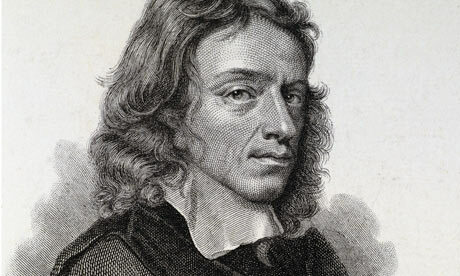 Milton (1608–1674) was a leading Parliamentarian propagandist during Interregnum/Commonweath in the 1650s, and he famously and eloquently countered the very popular Royalist tract Eikon Basilike with Eikonoklastes. In his famous poem “When I Consider How My Light is Spent”, Milton wrote about his increasing blindness and questions his God as to why this happened to him and how it is possible to serve Him by being thus. In this 17th Century poem, the main poetic devices are the following: prosody, situational irony, and tone. Prosody is used throughout. Milton has a unified rhyme scheme abba-cddc-efg-efg. Under further observation, the reader may notice that the last word of each stanza rhymes with the first of the next: spent, present, need, and speed. Milton also uses the standard poetry form of his time – the sonnet (which consists of fourteen lines). The character of the poem is the poet himself. The situational irony of “When I Consider” is that Milton knows that he is talented, but doesn’t know how to deal with it: “And that talent which is death to hide” (line 3). It is ironic because here is a man who is incredibly talented, yet isn’t able to use his talents, and his being thwarted in this is tantamount to a sort of death. Finally, “When I Consider” exhibits a woeful tone of loss. It is doubtless a great blow to lose one of one’s senses and this poem shows Milton dealing with this as best he can: through his writing. This poem was written by a deeply conflicted Puritan man, a talented man who lost his independence as he lost his vision. In these lines, Milton asks how he could work for God if his light is denied him? Patience replies that God has no need of his labour and that one can serve God simply by accepting the situation he sent to him (it would have provided some comfort for Milton to know that his blindness was simply part of God’s plan for him). Something modern readers would do well to remember is that most seventeenth-century people were much more religious than today, and so God and his power was, to many, quite important. The older I get, the more poignant and personal this major poem becomes! The opening lines of ‘Lycidas’, whilst reflecting the fact that the poem is a pastoral elegy also express a feeling that he is not quite ready to unleash his talent upon the world? A truly revolutionary poem that is still of much relevance today!